Optics are the key part of the optical system. The quality of the surface figure directly affect the performance of the system. With the development of the technology, the requirement of the optical system becomes much more strict, which requires correcting both the on-axis aberration and the off-axis aberration. Meanwhile, there are also strict requirements on the volume and weight of the optical system. It is much difficult for the traditional optics, such as flats, spheres and aspheres. Freeform surface is a new generation of ideal optical element, which can be defined as surfaces with no axis of rotational invariance (within or beyond the part). Freeform surfaces, in comparison with aspheric surfaces, may appear to have arbitrary and more complex shape, and regular or irregular surface structures. In freeform surface expressions, multiple parameters can offer more degree-of-freedom (DOF) to optical system design, which means it would be easier to correct non-symmetric aberrations. Freeform optics offers new opportunities to optical designers, since it can correct the image aberrations effectively, simplify optical system structure and enhance its performance. However, due to the large degree of freedom and strong deviations from ideal sphere, the measurement of freeform surface is a new challenge, which is the key limitation on its fabrication and application. FRT(fringe reflection technique) is a non-contact profilometry for measuring specular optical surface. 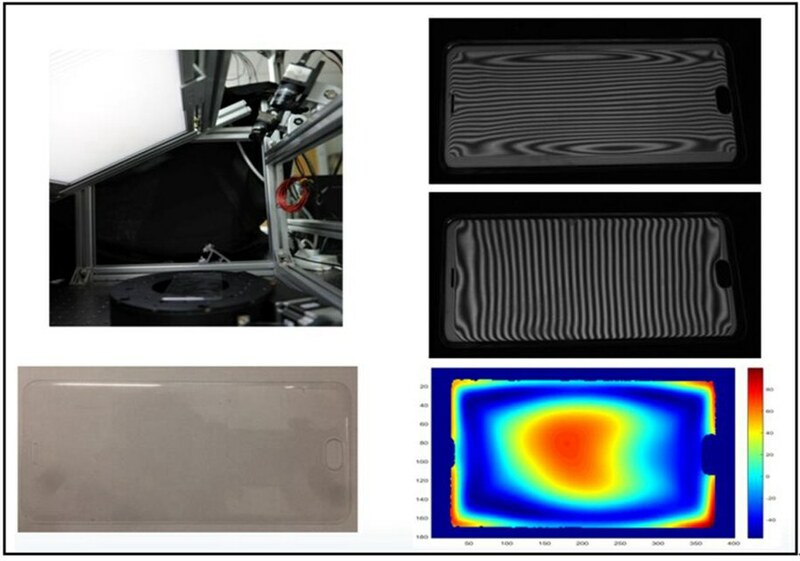 This method is able to achieve high dynamic range slope measurement by using computer-controlled large displays as light source without requiring specially designed null optics. The high accuracy of measurement can be reached by system calibration. The research shows that the FRT is a good method for the freeform surface measurement. The research team of associate professor Zhao Wenchuan focuses on the FRT (fringe reflection technique) surface figure measurement for several years. 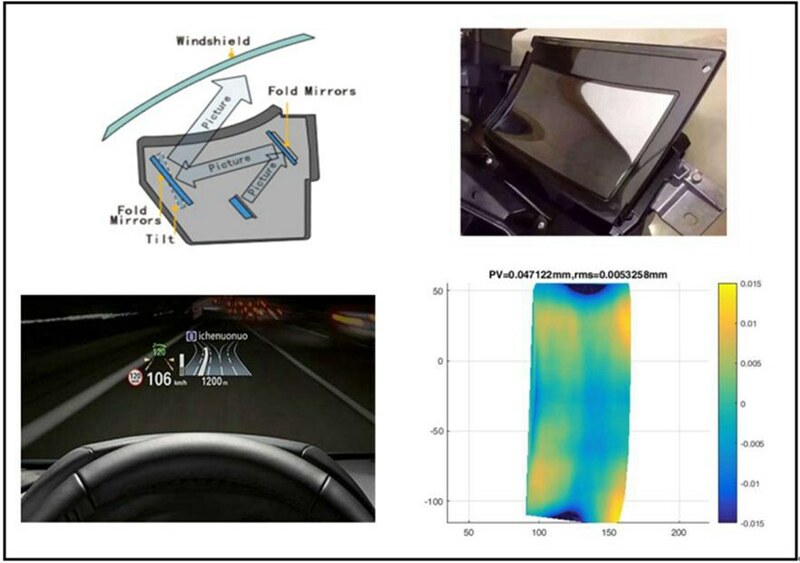 The FRT can be used to measure the surface figure of freeform optics and many industry products, such as the off-axis mirror, the freeform mirror of the HUD(head-up display) system and 3D phone glass screen. There are some testing results as follows. The research team of associate professor Zhao Wenchuan focuses on the FRT (fringe reflection technique) surface figure measurement for several years. The interests includes FRT(fringe reflection technique), interferometer and so on. The team has finished a foundation of Nature and Science Foundation of China(NSFC), and join many projects. They have published more than 40 papers, including 20+ SCI, and also apply more than 10 patents. Zhao W C, Zhou M, Liu H T, et al. The off-axis aspheric mirror testing based on the fringe reflection technique[J]. Opto-Electronic Engineering, 2018, 45(7): 170663.